For small businesses looking to create a website, the amount of resources available can seem overwhelming. There are hundreds of web design firms dedicated especially to small businesses. Thousands of web builders like Squarespace, Wix, and Weebly that make it possible for anyone, even those completely unfamiliar with web design, to create a chic, modern website. And hundreds of thousands of online advice columns to help in the website creation process. 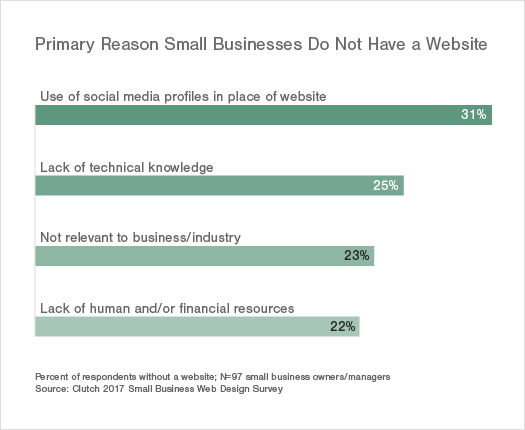 And yet, according to Clutch’s third annual Small Business Survey, small businesses continuously struggle to create and maintain a web presence. In 2016, Clutch found that nearly half of the small businesses surveyed (N=350) had not yet created a website. While a year later the percentage of small businesses with a website has increased, there is still a significant portion of businesses that continue to rely on more traditional, non-digital marketing opportunities. 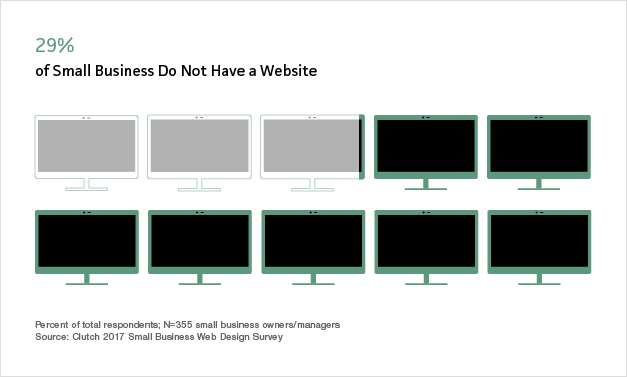 29% of small businesses do not have a website. Of the small businesses that do have a website, 79% say their website is mobile friendly. 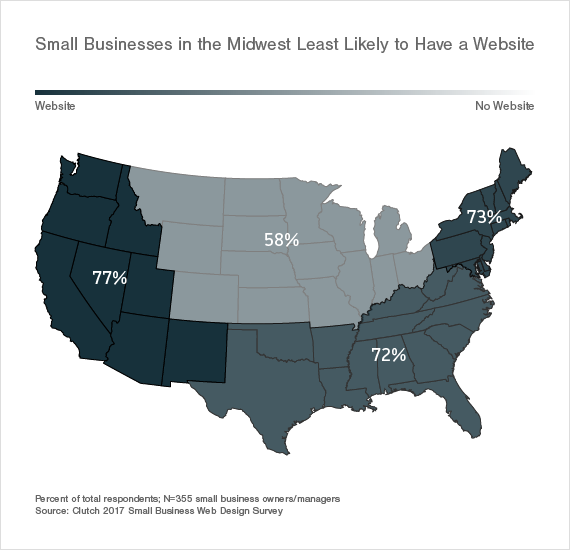 Only 58% of Midwestern small businesses have a website compared to the Northeast (72%), the South (73%), and the West (77%). 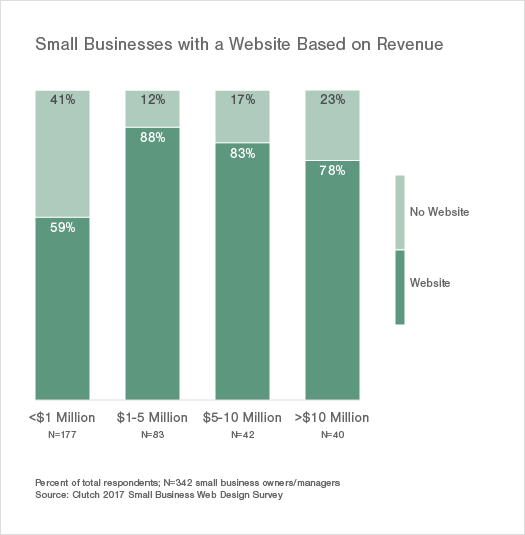 Low-revenue small businesses (those earning less than $1 million a year) are about 30% less likely to have a website than higher-revenue companies. 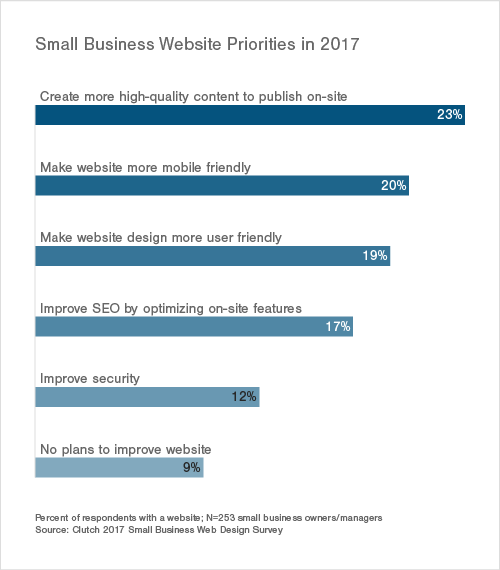 High-quality web content and increased mobility are top website priorities in 2017. Clutch’s 2017 Small Business Survey on Web Design examines the ever-evolving relationship between small businesses in the United States and their web presence. The survey addresses why some small businesses are more likely than others to value a web presence, what benefits small businesses receive from a website, and the major goals small business owners have for their websites in the coming year. To many marketing and web design experts, websites are no longer simply a “recommended” aspect of modern business. Because so many customers rely solely on the web to steer them toward new companies, a business’s web presence can make or break its success in finding and capturing new leads. In many ways web searches have replaced word-of-mouth referrals that were once the bread and butter of small business. A majority of small businesses (71%) indeed recognize the importance of a digital presence and created a website. Over half of small businesses surveyed launched their website before 2016, and another 16% launched in 2016 alone. 92% of small businesses predict that they will have a website by the end of 2018. While this prediction may seem optimistic, it points to the fact that the majority of small businesses recognize the value of a website and are at least aware of the missed opportunity of not having one. The ability to monitor and track business intelligence and other marketing data has become one of the fastest growing requests clients make to design agencies. “Web development firms like ours see a lot more clients relying on data this year. We have a better understanding of what’s going on behind the scenes with Facebook, Tracking Pixels, Google Analytics and other tools. There is such a wealth of data on what’s happening on a minute by minute, hour to hour basis. This means we can leverage data moving forward to make educated decisions on where we should allocate resources and efforts." -Michael Wynn, Creative Director & Owner, Full Blast Creative, a full-service marketing agency with a focus on web design. New tools and better education have made it possible for even small business owners to track relatively complex data trends on their website. Non-Mobile Websites Are "Dropping the Ball"
As the technical skill required to create a mobile friendly site decreases and the proliferation of exclusively mobile customers increases, it is more important than ever to ensure that every website is responsive. However, 17% of small businesses with a website have still neglected to launch a mobile friendly version of their site. A lack of upkeep is one explanation for why 17% of small business websites are not mobile friendly. For the sites created during the early days of the Internet, mobility was both largely irrelevant and highly difficult to implement. The lack of emphasis on mobility created a general apathy toward core website maintenance. Since the inclusion of smart phones and tablets in everyday life, the digital landscape has changed drastically. For small business owners more concerned with immediate business operations, the switch to a mobile friendly website could easily fly under the radar. Responsive web design has made strides in recent years as a better understanding of the actual marketing potential of mobile apps becomes more clear. While tech savvy entrepreneurs at one point, considered creating a mobile app a necessity, the emphasis has shifted away from dedicated apps and toward easily accessible mobile websites. Indeed, not having mobile friendly websites means small business owners miss a huge opportunity to tap into the quickly growing millennial and Gen Z markets that consider mobile browsing a part of everyday life. Ignoring website responsiveness can also have a major impact on a company’s ability to be competitive in search engines. In April 2015, Google rolled out an update that penalizes companies for failing to create a mobile friendly website. After this change, companies clamored to keep up to avoid falling from the search engine rankings. Mobile design has become more achievable as DIY web builders and web design agencies place a greater emphasis on designing a mobile friendly website from the start of a project, rather than allowing mobility to be an afterthought or add-on. While small businesses have made digital strides in 2016, there are still many companies who have yet to invest in a website. 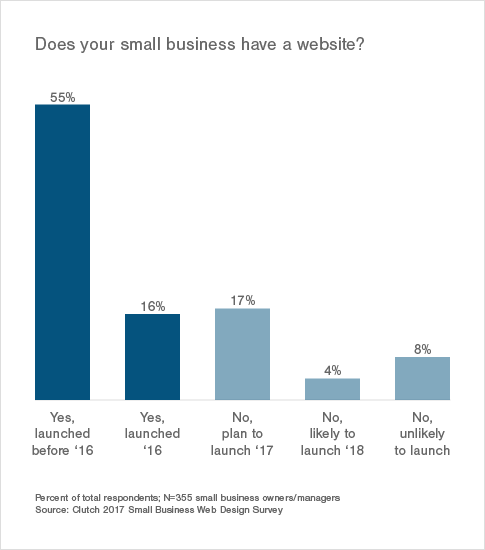 What kinds of small businesses are less likely to have a website? Understanding where the major deficits in website ownership lie can help web designers better strategize solutions that specifically meet the needs of the 29% of small businesses without a website. Strikingly, not every geographic region in the United States has the same percentage of website ownership among small business owners. Only 58% of small businesses in the Midwest have a website compared to the Northeast (72%), the South (73%), and the West (77%). This may be because the Midwest has been slow to cultivate a culture of tech start-ups like Silicon Valley in California, where small businesses are the most likely to have a website. “As a web development company in the Midwest, these findings are not surprising at all. Almost weekly, we encounter small businesses that do not have a website (or web presence) at all,” said Mark Tuchscherer, President, Geeks Chicago, a full-service design, development, and hosting agency. Some of the small businesses we talk to are not very tech savvy, and the thought of getting started with a website is overwhelming. They think that it is very expensive, and there is no cost-effective way to be on the web. There is still a lack of understanding regarding the importance of the web for all industries. The companies do not realize how much revenue they are losing each day they are not on the web. With “trendsetters” often based in LA and New York, it can take a while for the latest in web development to reach the Midwest. There is also a significant drop in website ownership when the revenue earned by a small business is less than $1 million annually. 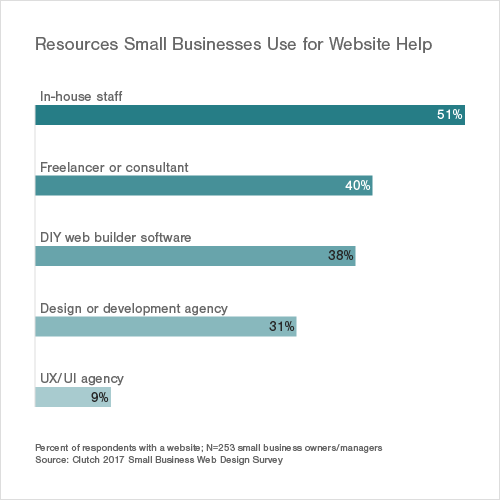 Unsurprisingly, low-income small businesses are more hesitant to devote the time and resources necessary to pursue a website. However, a website can be one of the most reliable lead-generators available and can undoubtedly prove an asset to low-earning small businesses. -Maresa Friedman, CEO, Executive Cat Herder, a small and enterprise business consulting firm specializing in growth and strategy. While the importance of a digital presence can easily be taken for granted by digital natives and web design professionals, 29% of small businesses still will refrain from launching a website by the end of 2016. This begs the question: why? Of the small businesses without a website, 31% instead use social media profiles to cultivate a web presence. Others have not launched a website because they lack technical knowledge (25%), claim a website is not relevant to their industry (23%), or lack the human/financial resources to do so (22%). However, according to experts in the web development industry every small business would benefit from having a website, and substitutions like social media often fall flat. While social media provides great visibility for small businesses looking to increase their brand recognition and event attendance, it lacks some of the major benefits of a dedicated website. Leads from social media make it incredibly difficult to track sales conversions. SEO is hindered when only social media profiles are used. Modern small businesses shouldn’t ignore the importance of social media in generating an engaged and committed audience, but they also need to understand the differences in marketing potential between a dedicated website and social media profiles. When it comes to cost there is no denying that hiring a web development agency for help launching a website can be a major roadblock for small businesses. With many agencies charging thousands of dollars per project, it can seem daunting to devote the money necessary to get a website up and running with an agency. -Bryan Clayton, CEO, GreenPal, a lawn-care start-up connecting customers with landscapers across the country. However, an easy work-around can be found in DIY website builders – a great, inexpensive substitute for a fully custom-made website. Though there is a moderate learning curve, modern DIY web builders make it much easier for small business owners to begin enhancing their web presence with little to no monetary investment. Considering the growing availability of DIY web builders, how many companies actually are taking advantage of this easy, inexpensive option? Of the small businesses with a website, the DIY website builder is the third most popular resource used. Other small businesses use a freelancer or consultant (40%), a design or development agency (31%), or a UX/UI agency (9%). The majority of small businesses with a website (51%) have an in-house staff that manages their website needs. However, many experts notice a trend: in-house staffers are responsible for maintaining a website without being given the proper training. Often, these staffers have expertise tangentially related to web design (social media marketing, graphic design, etc.). Unfortunately, the needs of a small business and the trends in web design are ever evolving, sometimes so fast that even the most advanced agencies have trouble keeping up. Without the proper training, a well-meaning staffer may accidentally cause havoc on a small business website. Small businesses that choose to manage a website with an in-house staff should be attentive to their employees’ skill sets and ensure that they have all the resources necessary to properly maintain a web presence. Professional development opportunities like coding courses, social media webinars, and web design tutorials can greatly help staffers create a successful website. One benefit of outsourcing to a web design agency – and one of the reasons why this option is so much costlier – is its ability to train in-house staffers on the basic coding and standards necessary to keep a web page going once the agency is out of the picture. Many agencies even provide on-going web maintenance for a small fee. Keeping a website up-to-date with the changing trends in the web design industry can be pivotal for a website’s ability to bring in quality leads. Over the years Google has rolled out various updates to its search engine algorithm that greatly affected a website’s ability to be found on search. This may be why 23% of small businesses are prioritizing high-quality content creation in 2017: part of Google’s recent push has been to encourage websites to provide useful and constructive body copy for their users. Leaning on the support of a design agency or hiring an in-house staffer with specific expertise in web design is one vital step small businesses should consider when attempting to keep their website updated. It is more important than ever to have a responsive, well designed website for your small business. Whether you are just starting out, think the web isn’t related to your industry, or don’t think you have the time and money, launching a website needs to be a top priority. Building a website can be the key to putting your small businesses at the forefront of your industry—and it might even be fun. –Diana Gardner Robinson, PhD., Founder, Choices Success Strategies Coaching, a life coaching and strategies service. Luckily, there are hundreds of options for small businesses to get started on their website. Weigh the pros and cons of partnering with a design agency, hiring an expert in-house staffer, or investing in a DIY web builder to ensure that your small business is getting everything it can out of its web presence. Clutch surveyed 355 small business owners/managers across the United States. Respondents answered questions regarding their experience with website ownership as a part of the 2017 Small Business Digital Marketing Survey. 42% of respondents’ companies have 10 or fewer employees, and 50% have an annual revenue under $1 million. Read detailed client reviews of web design agencies to find the best provider for your business. Choose the best solution for building a website from DIY web builders to web design and development companies.